Experiencing mental health challenges is really hard. Many people who try and live with these issues every day sometimes feel so discouraged they want to end their lives. Suicide is never a good idea. Why not? 1. People with mental health challenges get well and stay well. Sometimes they get better even if you don’t do anything about them. But there are many things you can do to help yourself feel better. Develop and use a Wellness Recovery Action Plan™ to help yourself get well and stay well. WRAP has kept many, many people alive. If possible, attend a WRAP group with a certified WRAP facilitator. 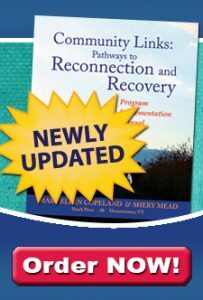 If you can’t get to a group, you can use any of the Resources listed at www.WRAPandRecoveryBooks.com, the on-line Build Your Own WRAP program or the new WRAP app. Tell someone how you feel–someone you like and trust. Talk to them until you feel better. Then listen to them while they tell you what is going on in their life. Get some exercise–any kind of movement will help you feel better. It doesn’t have to be strenuous. Eat something healthy like a salad, some fruit, a tuna fish sandwich or a baked potato. When you feel better, you will have many wonderful experiences–warm spring days, snowy winter days, laughs with friends, playing with children, good movies, tasty food, great music, seeing, hearing, feeling. You will miss all these things, and many more, if you are not alive. Your family members and friends will be devastated if you end your life. They will never get over it. They will think about it and miss you every day for the rest of their lives. If you have a box of family photographs, choose some photos of the people you love and display them around your house to remind yourself that you never want to hurt these people. 1. Develop a Wellness Recovery Action Plan® for yourself and then use it every single day as your guide to living. Include development of the Advance Directive and Post Crisis Plan. Include a comprehensive plan of how you could stay at home or in the community when you are having a very hard time. 2. Get rid of all the old pills and any firearms you might have around your house. 3. Give your car keys, credit cards, check books and computer to a trusted supporter when you are in the “When Things are Breaking Down” section of your WRAP–just in case you have a crisis. There are good people who can help you through these hard times. It may be your family members or friends. Set up a system with them so they will stay with you around the clock until you are feeling better. If you don’t have family members or friends who could do this, call your local mental health emergency services and ask them for help.